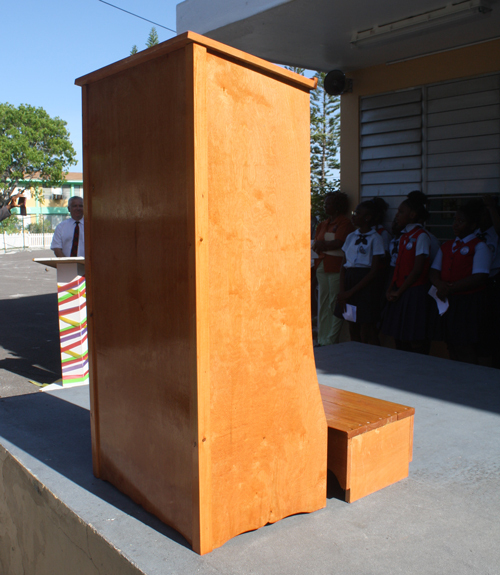 Claridge Primary was the recipient of a podium and stand built by BTVI’s Head of Carpentry, Graham Thornley. Shown in the rear from left to right are: BTVI’s Dean of Construction Trades and Workforce, Alexander Darville; Mr. Thornley; Associate Vice President of Fund Development, Alicia Thompson; Claridge Primary Principal, Sharon Robinson and BTVI’s President, Dr. Robert W. Robertson. 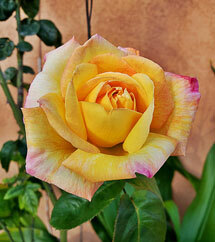 Photos by Shantique Longley. 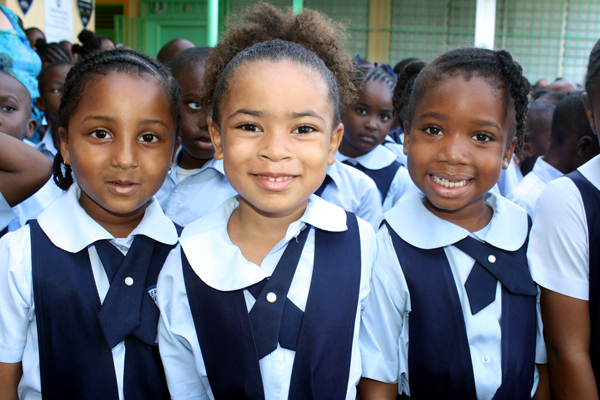 The Bahamas Technical and Vocational Institute (BTVI) recently made good on a promise to Claridge Primary to build a podium for the school. 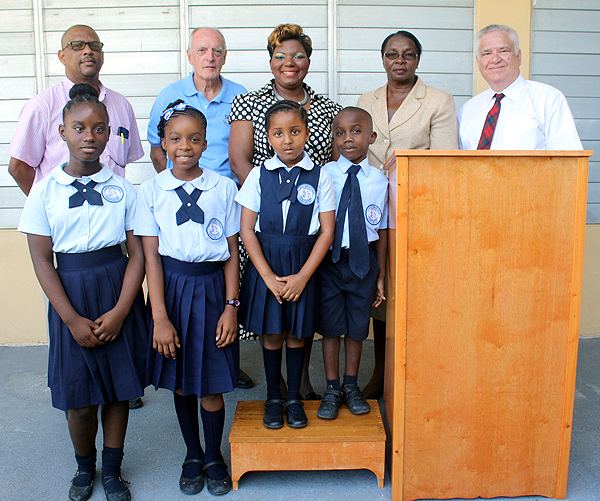 While at the school late last year to donate books during International Literacy Day, members of the BTVI team - led by President, Dr. Robert W. Robertson - noticed that they could use a new podium. BTVI’s Head of Carpentry, Graham Thornley was charged with the design and creation of the podium and an accompanying stand. Claridge Primary’s principal, Sharon Robinson, said the school was pleased to be the recipient of the podium and thanked the BTVI team for its generous donation. Ms. Robinson noted that the school’s logo will be placed front and centre on the lectern along with a sign indicating that it was donated by BTVI. Lower primary school students show excitement during the formal presentation of the lectern donated to the school by BTVI. 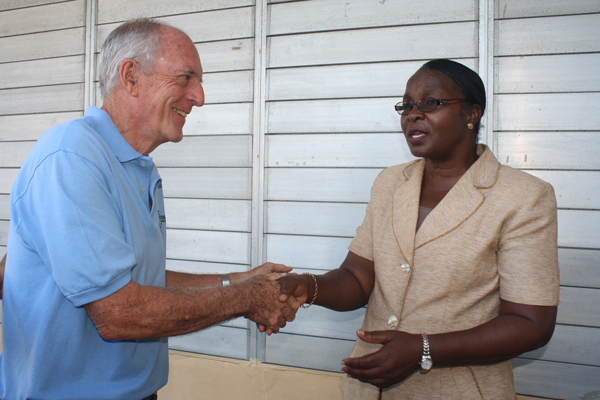 BTVI’s Head of Carpentry, Graham Thornley meets Claridge Primary Principal, Sharon Robinson following the official presentation of a podium and stand he built for the school.